I recently got into a conversation with my supervisor in which she contested the notion that fall in New England is superior to fall in other parts of the country. She emphasized the fact that leaves do, in fact, change outside of Massachusetts. She had a point. I understand that MA isn’t the only state in which, come October, the foliage becomes a spectacle, the air becomes crisp, Reese’s Peanut Butter Cups establish a stronger presence in the aisles of convenient stores, and the best movies of the year hit theaters. However, MA is my home, and fall looks pretty freakin good on the East Coast. To me, fall in New England is equivalent to a tropical vacation for most. While it’s not unusual for people to dread the cold and begin to withdraw as the days shorten, I become overwhelmed with relief. My experience has been that humidity is oppressive, and cool air is liberating. NYC reigns dominant in so many realms, but there is nothing in this crazy city that compares to fall in MA. To be specific, I can’t think of any place to go apple picking in Manhattan. 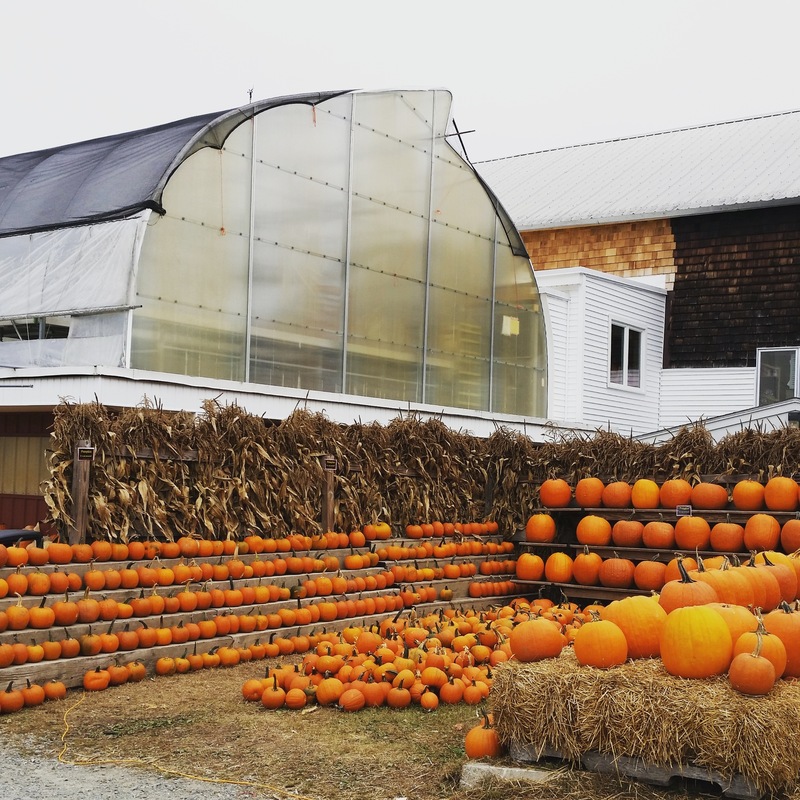 The fall ritual I hold dearest involves an annual visit to Cider Hill Farm, a fifteen minute drive from my hometown, Newburyport, MA. Cider Hill is a fruit and vegetable farm not surprisingly located on and around a sizable hill in Amesbury, MA. It’s a gem year-round, but from my perspective fall is its prime season. I have memories of field trips to Cider Hill in elementary school in which we’d be escorted up the hill in a tractor cushioned with hay, and educated about processes involved in maintaining, managing, and developing the farm. Beyond the land immediately visible from the entrance, the farm consists of another seventy acres. To staff this sizable production there are seventy or so farm employees. I’m not sure if I’m retroactively embellishing my memories because I’ve had such positive experiences at Cider Hill over the years, but I seem to recall these field trips involved both cider and apple cider donuts. 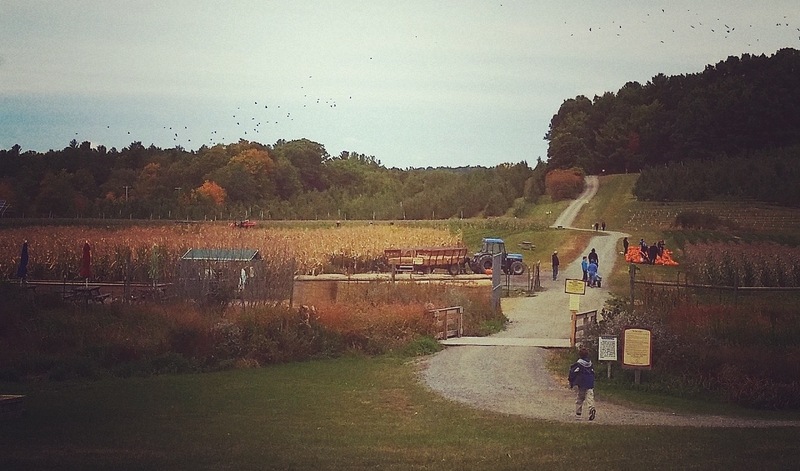 Looking back through my photos, I’ve noticed that nearly every year since I started taking pictures, I’ve documented a fall excursion to Cider Hill. Whether visiting for apples, pumpkins, or donuts alone, I’ve paid annual homage. In high school I had a group of friends in Amesbury, and occasionally we’d visit Cider Hill for no other reason than to soak up the sun. 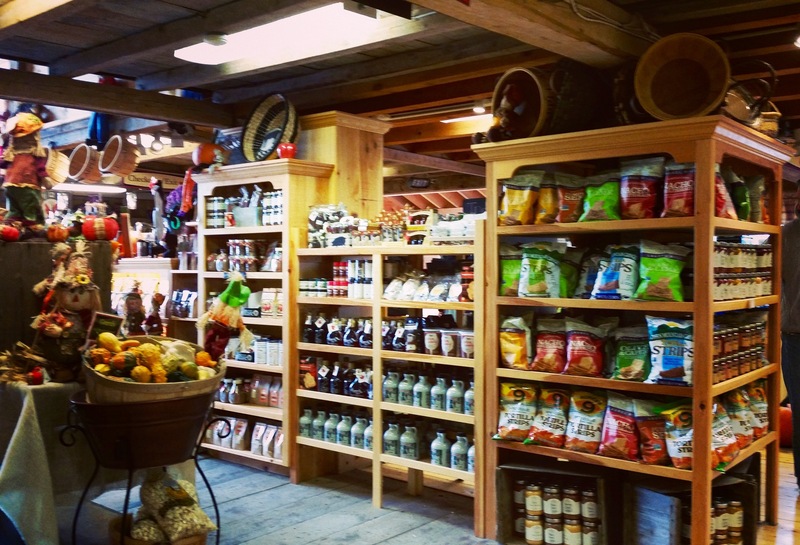 Even without time to venture into the farm, the farm store at the entrance is worth the visit in itself. Actually, the apple cider donuts alone are worth the trip. My approach is to inhale four during my visit, and to purchase several more for later (in the day). Last week, during a mini-vacation home, I was feeling overwhelmed because I’d created too long a list of things to do with the limited time I had. Naturally, my mom attempted to intervene and relieve some of the pressure I’d put on myself. She offered, “Why don’t I pick up donuts in the morning and bring them home while you run to the gym?”, to which I quickly responded, “You don’t understand!” No, I’m no longer in my teens, but I regress to adolescence when someone tries to deny me an opportunity to visit Cider Hill, whatever their intentions. 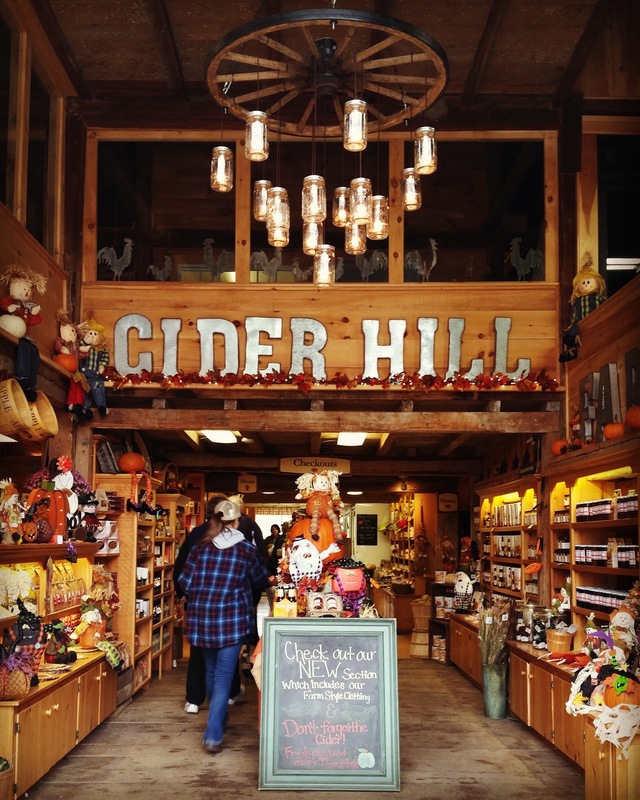 Cider Hill embodies all that I love about autumn in New England: pumpkins, apples, cider, donuts, hayrides, hay mazes, bright foliage, the whole shebang. If I’m home in October, however little time I have, I’ll always make it there. My mom and I ended up visiting the farm together the next day. The weather for our visit was cloudy and brisk – definitely appropriate for October in MA. It was a tad cold to draw the crowds you’ll sometimes see at Cider Hill in the fall, but busy nonetheless. Our specific mission was, as it always is, to purchase a large quantity of donuts. However, it’s near impossible not to get sidetracked in the farm store as it’s oozing with rustic charm, handy knick-knacks, kitchen supplies, fresh fruits and veggies, and of course, things like honey sticks. As we waited in line for warm, sugar-coated apple cider donuts, we happened to run into Karen Cook, who co-owns Cider Hill with her husband, Glenn, and has apparently known my mom for years. Newburyport is technically a city, but to me it has always had a small-town feel that extends to a few neighboring communities. I remember Karen from my early tours of Cider Hill, and I hadn’t realized my mom had known her all this time. She mentioned to my mom, who’d owned a store in Newburyport for over twenty years, that she wondered where she could order chicken shaped handbags for farm-enthusiasts that my mom had once carried. Talking to Karen provided the emotional recharge I’d been craving in recent months in NYC, a place where you can walk for miles without spotting a familiar face. I’m not saying I don’t have serendipitous encounters with people I know in NYC; it’s simply that when I visit home, I can expect them. To summarize my impression of Karen, I’d describe her as exuberant, industrious, open and compassionate. She has an infectious smile that draws you in, and an admirably expressive and honest nature. Karen’s level of devotion to the farm and commitment to community, both within the farm and in a larger context, are tangible and intense. After a few minutes of conversation, my mom brought up that the next day we’d be participating in a walk to benefit individuals with primary immunodeficiencies (PI) in support of my nine-year-old brother (a remarkable kiddo who happens to have a PI), and it turned out Karen had tremendous insight on the subject. Her own understanding of immunodeficiencies, which had resulted from her own family experiences, offered my mother the opportunity to connect with someone about the topic on a much deeper level than she’s typically able. Karen ended up donating two big boxes of apple cider donuts to the walkers my mom would be hosting for the event (which would include a group of hungry and enthused nine-year-olds, among others), and made a huge impact on us both with her generosity. I left wishing we were somehow related. Although I was only really peripherally involved in this exchange, and it was truly a bonding session between my mom and another person she could relate to in an unusual way, I think it’s worth mentioning because of what it represents. Sure, in NYC it can be nice to be anonymous and independent, but this sort of personal encounter is what continues to draw me home, and every year brings me back to Cider Hill. It wasn’t until this year that I’d really had a chance to meet Karen outside of a group setting, but every time I visit I seem to run into a person or people I know. Amidst the crowds visiting from all over to check out Cider Hill, there are always Newburyport and Amesbury natives present reminding me of how lucky I’ve been to grow up with a solid sense of community. I shouldn’t have any trouble finding a donut worth gushing over now that I’m back in NYC, but I’d be hard-pressed to find one with ingredients quite so sweet as those at Cider Hill Farm. What a rich and evocative essay! I enjoyed it. It’s always nice to read a writer who is able to explore off the beaten path and find things to love about her home region. Thank you very much, I really appreciate your feedback! Sometimes having a blog feels, to me, like submitting thoughts and ideas into a black hole, so I’m always thrilled to hear that someone’s enjoyed a post!